Today is the Boat Race, the great row show-down between Oxford and Cambridge Universities. Now in its 156th year, the original idea for the event came from two friends Charles Merivale (a student at Cambridge) and his school friend Charles Wordsworth (nephew of the poet, and a student at Oxford). On 12 March 1829, Cambridge sent a challenge to Oxford, and thus the tradition was born (which continues to the present day), where the loser of the previous year’s race challenges the opposition to a re-match. Oxford won in 2009 and Cambridge currently lead the series by 79-75. Though the race retains it’s 1800s essence, these days it’s a major international sporting occasion that draws millions of TV viewers around the world. 250,000 spectators crowd the banks of the Thames to witness the action. The race runs along a tidal section of the Thames, called the Tideway, where the currents are unpredictable due to water-level and weather. The rowers selected to represent their university will get a Blue (dark blue for Oxford, light blue for Cambridge), but it’s far from easy to get in those boats. Triallists go through rigorous training and selection programs until coaches are confident they’ve got the best crew. To add to the challenge, rowers must keep on top of their studies. Thomas Eakins (1844 – 1916) – one of the most outstanding oil painters of the American Realist tradition in the 19th century – will get us into the rhythm of the boat today. His Biglin Brothers Racing (1872) is one of his greatest works. In the decade following the Civil War, rowing became one of America’s most popular spectator sports. When its champions, the Biglin brothers of New York, visited Philadelphia in the early 1870s, Thomas Eakins made numerous paintings and drawings of them and other racers. 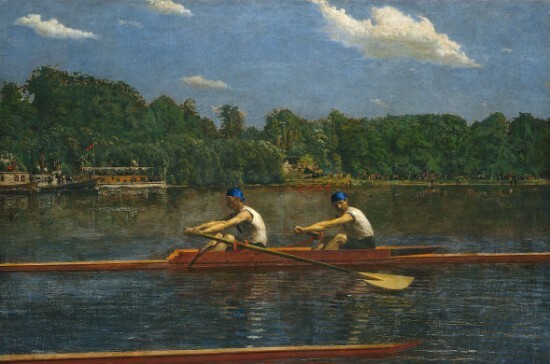 As an amateur oarsman and friend of the Biglins, Eakins has an eye alert to the detail of the sport. 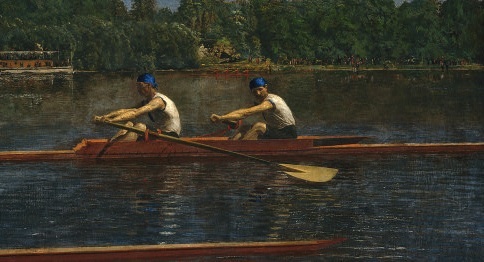 You can tell the artist knows a thing of two about rowing technique: see how he shows John (up front) with his blade still feathered, almost at the end of his return motion. Barney, a split-second ahead in his stroke, watches for his younger brother’s oar to bite the water. The brothers, and the pointed prow of a competing craft that’s pushing in from the left, fill the lower half of the composition, lending an in-the-thick-of-it immediacy to the image. In the upper half of the picture there’s a tiny four-man crew, crowds on the bank of the Schuylkill River and spectators watching from steamboats decked out with fluttering flags. One of the winning things about this picture is the precision of Eakins’s style. While he was at the Pennsylvania Academy studying art, he took classes in anatomy at the nearby medical college. He later introduced anatomy, dissection and photography to the art curriculum when he himself became a teacher at his alma mater. His fascination for scientific realism can be traced in the musculature of the boatmen, their sense of 3D form, and dainty details like the light catching doublets and oars. The exactitude and energy of this painting backs up the fact that boating and rowing were among Eakins’s favorite themes. I love the sense of urgency and pace that he adds to a still image by cropping the Biglin boat at either side. This longer and closer look at an instant that in reality was over in seconds, channels all kinds of excitement and emotion into the work. Because a rowing race is always a beating battle of grit and courage, no matter who crosses the finish line first. 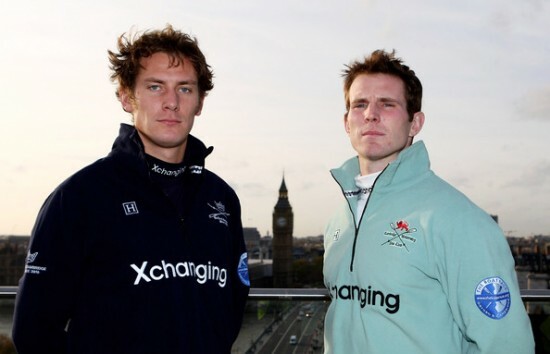 The Boat Race Presidents are shown below – a Dutchman heading up the Oxford crew and an American captaining Cambridge. Congratulations to the Tabs!